Modular and Manufactured Homes available through Fremont Homes. Inc.
At Fremont Homes we are proud to offer a large selection of both Manufactured and Modular Homes to our clients. The "modular" which is also referred to as a" B.O.C.A." code home, is a home built to meet or exceed the more ridgid Michigan Building Code. This means that anything required when site building a home, is also required for a modular home. Generally, modulars are stronger framed than most site built homes because they are constructed using 2 x 6 exterior walls. Besides the strength in framing that this 2 x 6 wall brings, it also allows for 50% more wall insulation than can be fit into the common 2 x 4 wall of a typical site built home. Before each modular is sent to Michigan, it is inspected by a Michigan building representative to verify that during each phase of construction the home meets or exceeds Michigan building codes. A modular is typically installed onto a basement, however, it is also possible to install one onto a crawlspace. The furnace and water heater can be placed in the basement or on the main floor. We have over 60 modular floorplans to choose from and offer only the highest quality at the lowest prices. At Fremont Homes we sell both modular and manufactured homes. A manufactured home or "doublewide" is built to a Federal Building Code referred to as the HUD code. Before a doublewide is sent to its destination, a representative from the Department of HUD must ensure that it was built to meet or exceed all HUD building code rules and regulations. A doublewide is specifically designed to go on a crawlspace rather than a basement. The lower cost of a doublewide can add up to major savings for those who are looking for a more economical project. We have over 60 doublewide floorplans to choose from and we make sure that we offer the highest quality at the lowest prices. Click here to view our Manufactured Home models. 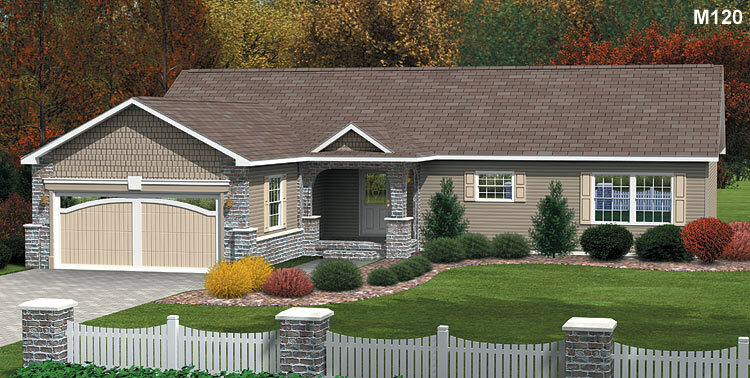 Click here to view our Modular Home models.